This entry was posted on March 16, 2018 by chris elliott. Make sure you choose the correct type of bamboo floor for your property. Bamboo flooring not only comes in different colours and styles, but there is also a choice of either a tongue and groove fitting style or the more popular click fitting. 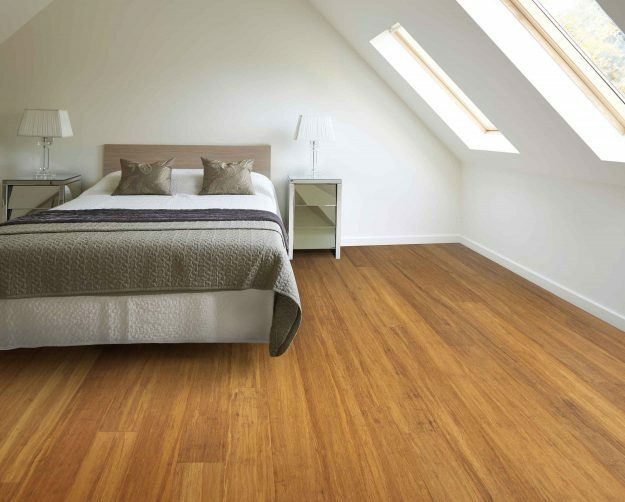 Certain subfloors may require a particular type of bamboo, for example: if you want to install over joists, your bamboo floor must be at least 18mm in thickness in order to withstand the additional pressure. Have a look at Fitting bamboo flooring onto different subfloors for further information. Another good example is if you have underfloor heating, make sure you choose one of our floors that is compatible with underfloor heating systems. 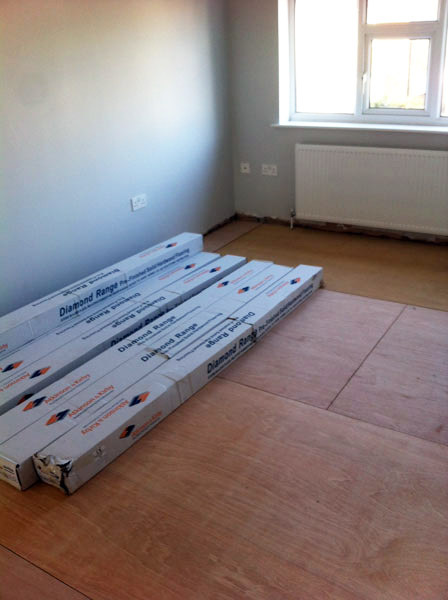 This will mean that the flooring has been designed and tested to withstand the changes in temperature from underneath. The last thing to be mindful of is where the bamboo floor will actually be going. If you are installing your bamboo flooring in a room that is fairly busy, then perhaps use Strand Woven Bamboo. This particular type of flooring is extremely durable and hardwearing. Have the bamboo flooring delivered in plenty of time before installation. Leave the bamboo (in its packaging) in the room where it is going to be installed for at least 48 hours. The room should be dry. The bamboo should not be left on a damp floor or in a room with wet plaster on the walls. Do not leave the bamboo directly next to a radiator or heater. Your subfloor is the existing floor in your property. Preparing your subfloor is probably one of the most important parts of installing bamboo flooring. If your subfloor hasn’t been checked and tested correctly, you bamboo is at risk of irreparable damage once installed. The main things to check are whether your subfloor is flat, level, dry and clean. Use a Moisture Meter to check the Moisture Content (MC) of your subfloor. For a wooden subfloor it should be 16%MC or below. For a concrete subfloor it should be below 6%MC. If your subfloor is not dry enough you must give it more time to dry naturally. Clean your subfloor to remove any old chemicals or adhesives that may still be present. Then sweep away any dust, dirt or debris. There will be more in depth information about your subfloor preparations in the bamboo flooring instructions. The instructions that come with your bamboo flooring are extremely important. They will give you a step by step guide of how to get your room ready for your flooring, and how to fit your bamboo flooring. You will find the instructions in the boxes of the bamboo flooring. They are depth and detailed, but if you do have any other questions, then please contact us. We will happily answer any questions you have and offer you technical advice and guidance. It is a good idea to think about what equipment you may need to be able to install your bamboo floor. For example, if you are thinking of floating your bamboo, have you got the correct style and amount of underlay. If you are fixing your bamboo flooring down, then have you got the right glue or nails? And finally if you are using tongue and groove bamboo then you will need WPVA glue to adhere the joints together. Of course, bamboo flooring can be laid in any direction, but it is worth thinking about how you want your finished room to look. The most popular direction to lay your flooring is lengthways according to the path of light coming into the room. This is so that the light highlights and accentuates the planks of flooring, showing their natural beauty and charisma. You should also think about the size and shape of your room. Running flooring along the length of a smaller room can help to create an illusion that the room is larger. The only time to be careful is if you are nailing your bamboo flooring down to existing floorboards. In these circumstances you must lay the bamboo perpendicular to the floorboards to give additional strength. 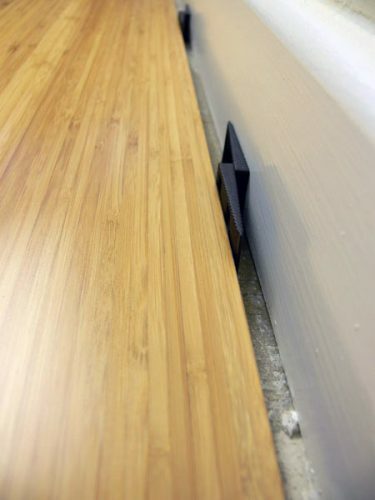 When you are installing bamboo flooring, it is essential that you leave an expansion gap around the perimeter of the room. The gap should be at least 10mm and needs to be left around the entire edge of the room, including doorways, fireplaces and pipework. You can buy special flooring spacers that assist you in leaving the correct sized gap. The expansion gap need to be left to give your bamboo space to naturally expand and contract with seasonal changes in the weather and humidity. If no gap is left, your flooring will have nowhere to expand into and it could start to crack or lift up. Don’t worry about how the expansion gap will look. It can easily be covered up with bamboo flooring accessories like skirting and door bars. Installing bamboo flooring depends upon which type of bamboo you have, the subfloor in your property and how you have chosen to fit the bamboo. The most important thing to do is follow the information on the instructions carefully. They are there to help you to get the best possible results from your new bamboo flooring. If you want further advice or are unsure about anything, please contact one of our technically trained team. Once your bamboo flooring has been installed, your room will need finishing off with some flooring accessories. 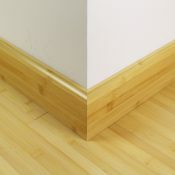 You will have expansion gaps around the edge of the room, which can be covered by a range of bamboo mouldings, such as: skirting, beading, door bars, pipe covers or even stair nosing. Sweep every day with a soft brush to remove dust and dirt. Clean once a week (or more often if needed) with a PH neutral wood floor cleaner and microfibre mop. Never use a steam mop or wet mop – they can damage your floor. Wipe away any spills immediately. Take off outdoor or spikey shoes before walking on your floor. Use felt protector pads to protect your bamboo from furniture.